Okay, I admit. I have a problem hobby. When we lived in our little one bedroom apartment, it was always a struggle trying to figure out how to stack all the books I acquire from sales and the internet on this shelf. It started out as one shelf then turned into two. The bookcase has four shelves total and I allowed my husband to use one for his video games and the very bottom one was for my Disney movies. This is one thing I’m very particular about. They have to be shelved by author, and on top of that, in order by series. 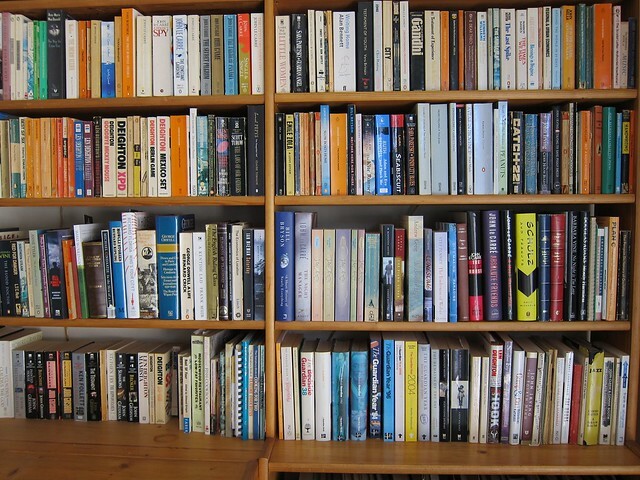 When shelved vertical, series order is always left to right not right to left. When stacked horizontally, series order is always top to bottom not bottom top. If I have doubles or stand-alones, they’re stacked by book size. The series I like the most have to be stacked in front and visible when I stack horizontal. Before you ask, yes, I’ve read every book in both pictures except Haunted, An Ember in the Ashes, Persona, and Storm Siren and my collection has doubled since. You’re helping me convince me; you just don’t realize it yet :P. I’ll email you a pic of the updated shelf situation. 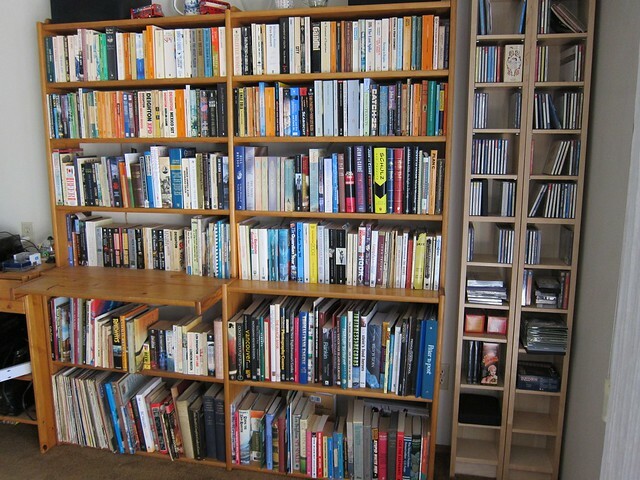 We have books in almost every room in our house except for the bathrooms, dining room and kitchen, but they are all my husband’s 🙂 He also has a huge bookcase of well over 2-3,000 CDs. Hubby has them all in a special order and even created a database for them with a printed catalog. He’s not really OCD, though. He also orders something almost every other day online, so we have boxes on our front stoop all of the time. I’m the opposite. I don’t collect anything and I have significantly fewer things than my husband. The only thing I buy too much of are groceries. I rescued you from spam! I saw the CD collection! That’s pretty amazing! I’m okay with buying a lot of food hahaha! Luckily the CD collection hasn’t been growing for a while. Hubby now gets a lot of music from the internet. Oh, if only I could cut down a bit on the grocery bill. That is the only thing I spend a lot on, otherwise hubby is the bigger spender. I keep an excel sheet on Google Sheets, because I can access anywhere, of all the books and Disney movies I have so i don’t buy doubles. I also note if their hardback, paperback or trade paperback and then I organize them as you read in the post. You’re even more organized than my hubby. But it is a beautiful site, right? I think it’s the best sight! See?!? You totally get me! You are 100% right! Not enough space so I had to work with what I had at the time. I’m also a paper girl but I like ebooks too cause they’re quicker to get and I can take multiple books with me on a trip. You can totally consider donating those classics to me just saying 😺 they’d have a great home in this house! Haha, you’d need a lot more bookcases! A pity you didn’t live close by…for a number of reasons! We’d tear up the town…ok, we’d find a shady place to read, but it’d be fun! I agree…e-books/paperbooks…as long as it’s a book, it’s a good time. I’m drooling at your situation. I need to up my shelving game! I’m drooling at your situation. I need to up my shelving game! I think it’s pretty amazing that you remember the Dewey decimal system. I worked in a library for years in my college days and I barely remember any of it! Whoops! I just see that you do. Sorry. I had to reread a little again. My memory isn’t always so good. People think they have a boring life, but if they would only read, they would never be bored at all.